It’s the most vibrant time of the year – the 41st Sydney Gay and Lesbian Mardi Gras Festival is upon us, kicking off on Friday 15th February, taking over the city for weeks and finishing with a loud and proud bang that is the parade down Oxford Street. And when it comes to celebrating Mardi Gras, The Beresford is hard to beat, being an iconic spot for the LGBTQI community since forever. But before we dive into all the fun and festivities that are in store this year (bring on the bulldogs in bowties at the dog show), we thought it would be interesting to take a walk down memory lane and find out a bit more about the history of Sydney Mardi Gras and The Beresford. First things first. Let’s get schooled on Sydney Mardi Gras, because it wasn’t always all fun, floats and fabulousness. On a cold night in Darlinghurst, 1978, a small group of protestors marched down Oxford Street to participate in the international Gay Celebrations. However, things quickly took a turn, with police attacking and arresting protestors. This night marked a significant turning point for the Australian LGBTQI community, making them determined for the event to be even bigger the next year. And that’s exactly what happened – in 1979 up to 3000 people marched in an incident-free parade. From here it only got bigger and better, with spectator numbers peaking at a massive 500,000 in 1993. Today, Sydney Gay and Lesbian Mardi Gras is one of the most famous parties in the world, drawing in crowds of around 300,000 last year, with over 12,000 participants. One place that’s seen it all through the decades of drag, debauchery and disco dancing is The Beresford. Back in the day, it was pretty much a party venue for day clubbing with a diverse crowd, welcoming everyone from bikies to drag queens. It was never specifically a gay bar, but has always been very inclusive. 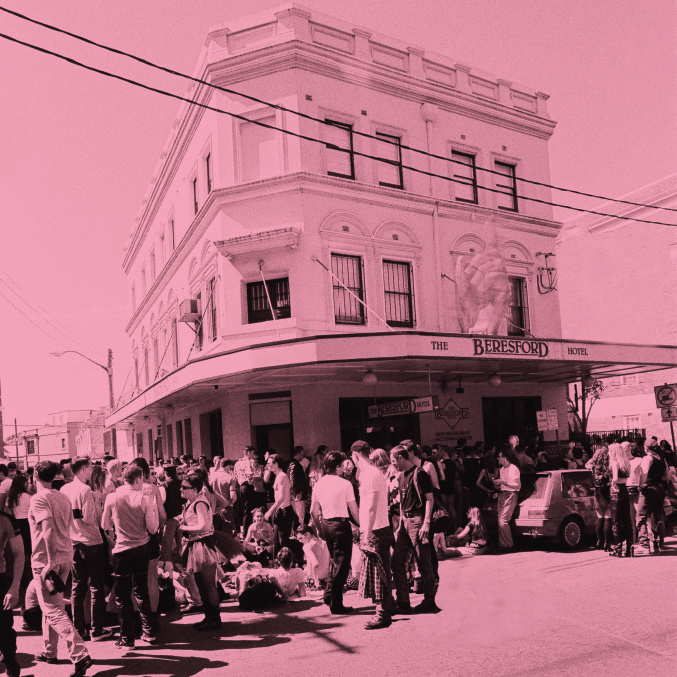 When Merivale got the keys in 2011, it remained a hot spot for LGBTQI locals while welcoming a mainstream crowd too. And while the pub is still famous for its parties (especially it’s Sunday sessions), it also became a place for political discussion, community involvement, charity work and driving change. Talking about change, one momentous event The Beresford was proudly involved in was the Yes campaign back in 2017, working with Marriage Equality the weeks leading up to the vote. When vote day came around, the venue hosted over 2000 people for a Yes party. Of course, it was madness for the first hour or so, but the SOS was put out to other Merivale venues, and within an hour there were about 30 staff from all different venues helping out, making sure every guest had a celebratory drink in hand. This year will be the second Sydney Mardi Gras since that historic day and The Beresford is celebrating with a jam-packed calendar of events that’s their biggest one yet. There’ll be a Mardi Gras edition dog show, Absolut brunches, Bingay charity bingo, the Absolut Passport Party that will show international guests how we get down, down under and even an Abolut Mardi Gras cocktail with $2 from every drink going to The Bobby Goldsmith Foundation, Australia’s longest-running HIV charity. And always be prepared for something unexpected to pop up at The Beresford, especially during Mardi Gras – a few years ago pop princess Kylie Minogue surprised fans with a last-minute one-song performance. Of course, there’s also the main event. The parade will be held on Saturday 2nd March, filling Oxford Street with jaw-dropping and eye-popping costumes, colour and creativity. If you’ve never seen the parade in the flesh before (and there’s plenty of that) this year is a must. Our hot tip for watching the parade? The Beresford of course! This year there will be a live stream of the parade in the courtyard – why queue outside with the masses when you can watch it in the comfort of the courtyard with a cocktail in hand?! Of course, all good things have to come to an end, and there’s no ending quite like the famous Laneway Party. This cherished tradition of the festival began in 1979 when revellers flocked to the tiny Hill Street Lane outside The Beresford for an impromptu after-parade party, armed with nothing but a portable stereo and the last remains of their costumes (pictured above). The Laneway Party has been the go-to place to continue the party, swap stories and recover from the night before, and the last few years has seen some huge live acts join in the fun, and this year will be no exception with Sneaky Sound System headlining. No matter who you are or who you love, the festival welcomes everyone with open arms, so get a group together and get involved in the fun! Wishing you all a happy Sydney Gay & Lesbian Mardi Gras Festival! V- Day needn’t be a tacky, gag-inducing affair. Establishment concierge, Kyle Hirst, has the inside scoop on planning a heartfelt but schmaltz-free evening.